Heat oil and butter in pan. Add bay leaf, onion and mix well. Add carrot and garlic and sauté for ½ minute. Add tomatoes, salt, black pepper, and water mix well. Cover pan with lid and cook for 10 to 15 minutes or tomato soft. Take one mixi bowl and blend well tomatoes mixture and make smooth pureed. Pass it through a strainer. Heat pan and pour this strained tomato mixture, salt, sugar and let it simmer for a couple of minutes. 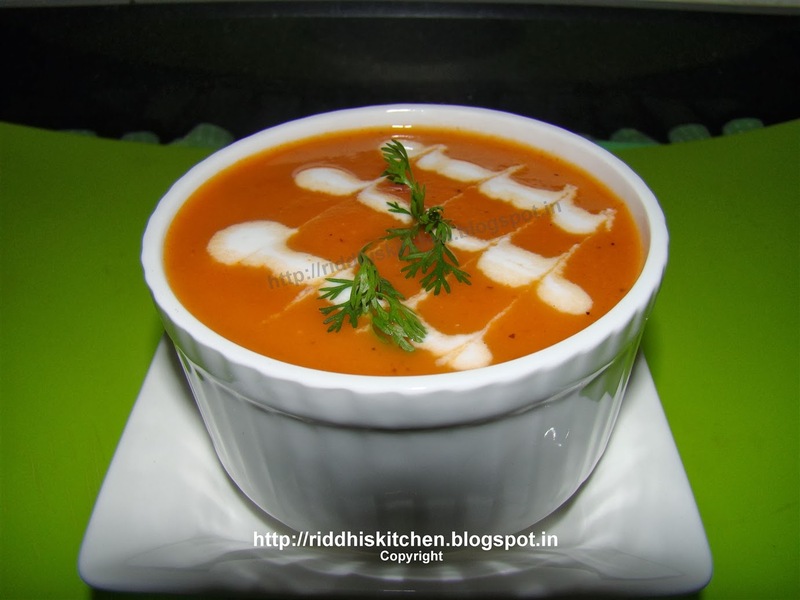 Take serving bowl, pour soup and garnished with cream, fresh coriander spring and serve hot. Tip: you can also add cream in tomato soup.